"Mama Love for Troubled Times" is for those times when the need for comfort is so deep it would have to come from the Great Mother herself. It was guided to me when I divorced and couldn't stop crying. I think of it as being for trauma or grief. But I also use it for any extremely stressful transition. 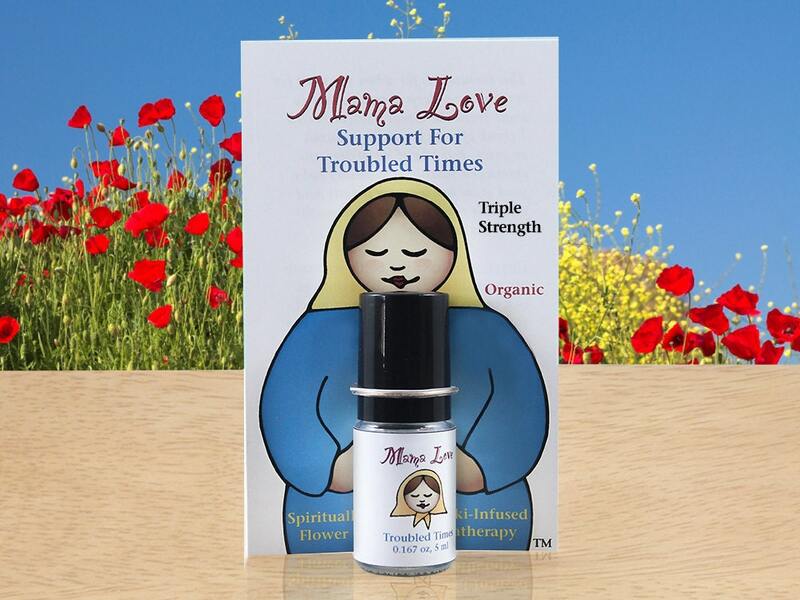 Mama Love products combine the emotionally soothing properties of flower essences and aromatherapy. They're spiritually-guided and infused with Reiki to bring you the most beneficial products I can make! For feeling loved, safe, grounded and protected, to ease sadness and pain, to encourage relaxation, and ease a worried mind. For when you need a hug and only Mama will do, for the ability to persist when things feel so hard you don't know if you can manage it, soothing support for shock or trauma, and for supporting a deep sense of wholeness from the inside out. 95% organic. Essential oils and flower essences in a nonalcoholic jojoba oil base. This flower essence aromatherapy product is intended to be used like perfume; however, you won't impact an entire room like a commercial perfume made with synthetic extenders or alcohol. It is primarily a gift for your emotional and spiritual well-being. Your body is meant to soak it up and USE it. You may need to reapply it later in the day to renew its scent and beneficial effects. WHOLESALE pricing for for this item is available. Send me an Etsy convo or email for more details.